By LUDWIG VON KOOPA - Featuring some very long-awaited sales figures. No matter how good Nintendo's. financials get, it's like the stock market doesn't care. Bummer. In other news, Nintendo is making some sweet money as of their quarter ending June 30, 2018. 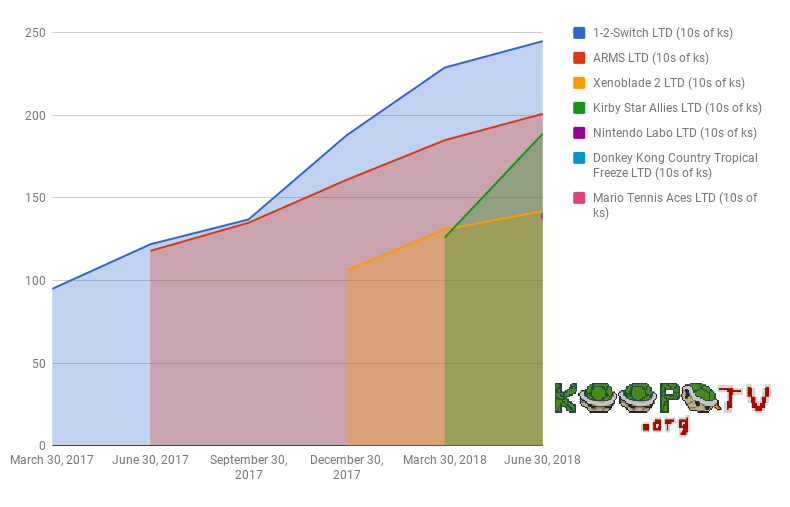 I know you don't care about the particulars (you don't go to KoopaTV for stock picking or financial news), but just know that everything is holding pretty steady (aka good) except for the 3DS, which continues to collapse in terms of numbers sold, as you'd expect. There's only so many kids 5–8 to sell to. Meanwhile, the Nintendo Switch has sold 19.67 million units as of June 30, and 86.93 million units of software. Among the top software are Super Mario Odyssey (11.17 million), Mario Kart 8 Deluxe (10.35 million), The Legend of Zelda: Breath of the Wild (9.32 million), and Splatoon 2 (6.76 million). And then there is a big gap going down to the 2 million units, but your takeaway for those four games is that they make up almost half of all Nintendo Switch software sold. Chart showing the life-to-date, in tens of thousands of units, of various games and the Nintendo Labo. While the Labo has obviously not outsold the life-to-date of ARMS (1.39 million to 2.01 million), it has outsold ARMS within a comparable time period. (Between April 27, 2018 and June 30, 2018, the Labo sold that 1.39 million units, while ARMS sold only 1.35 million copies from its release in June 16, 2017 to September 30, 2017.) I think that counts as the Labo selling better than ARMS. The star of the sales figures is Kirby Star Allies, which continues to have wonderful sales movement. (It hasn't overtaken ARMS... yet.) Special shout-outs to Mario Tennis Aces, which was supposed to be Nintendo's biggest thing in the first half of the year along with the Labo, selling less than Donkey Kong Country: Tropical Freeze's port. Nintendo screwed that one up. And shout-outs to Donkey Kong Country: Tropical Freeze for making it there. I was waiting the whole Wii U lifespan for that. Do you have any more sales-related bets you want to make for three months from now? Tell KoopaTV what they are. ShinyGirafarig has earned herself a retroactive (applying for this round) Truth point for ending up correct. On that note, tune into KoopaTV on Wednesday for an update on the KoopaTV Loyalty Rewards Program! Click here for the first edition of that chart — for when the fiscal year/quarter ended in March 30, 2018! If you're wondering about when Travis Strikes Again releases, look here. It's worldwide, too. The next financial update (September 30, 2018) is here!